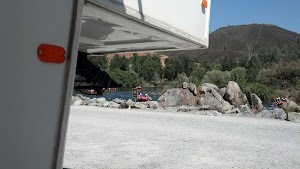 One of my lessons learned this summer has been that I need to make peace with water/electric only camping. As Thousand Trails members we’ve had to decide between sites we liked for one reason or another and sites that offer sewer hookups and not much else. 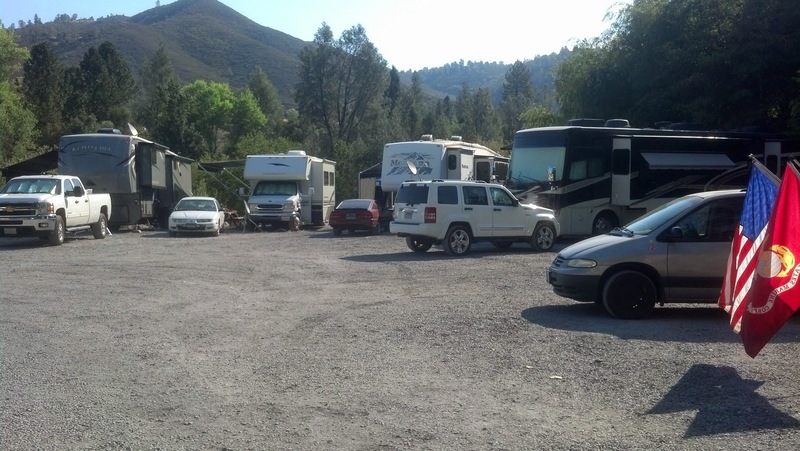 Of course, beyond that we’ve been in several campgrounds (Thousand Trails and others) where full hookups are simply not available. My earlier feeling was that not having full hookups was going to be fairly unusual and it wasn’t necessary to make any special plans for that possibility. These days, I’m thinking it’s more common, especially in the west, and that I need to have an approach for dealing with partial hookups on a somewhat regular basis. Our stays are generally 10-14 days. Our black water tank is plenty big enough for that, but our gray water tanks tend to fill quicker and need to be emptied during our stay. One could tow a blueboy through the campground to the dump station, but in some parks the dump station is unreasonably far from the campsites. Some campgrounds offer honey wagon service but it can be rather expensive. We opted to get a macerator pump. Using it the blueboy can be left in the bed of the pickup and the macerator used to pump the waste water using an old water hose. 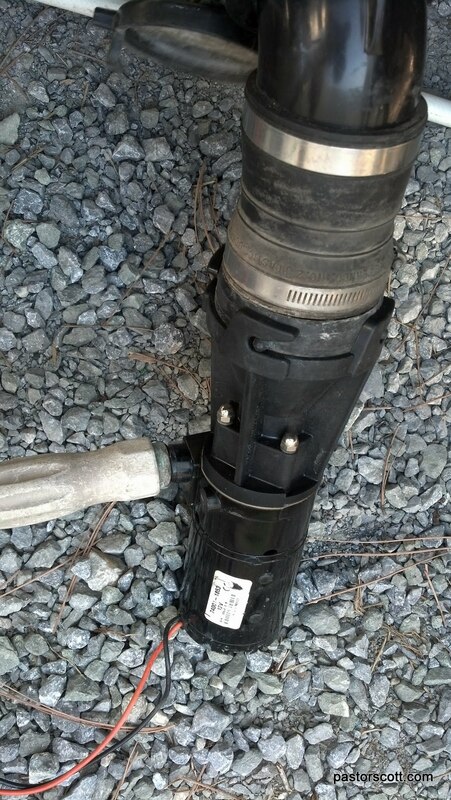 Then, I just drive to the dump station, attach the 3″ sewer hose to it and dump in just a few seconds. I actually own two blueboys: one is 15 gallons and the other is 40. I opted to carry the 15 gallon one for my 2014 adventure but now that I have the macerator I’ll be carrying the big one in the future. My approach has been to dump once daily (and it can be done as we leave the campground rather than part of a special effort). Then, as we get closer to moving day we just let the tanks begin to fill up. I bought my pump from a fellow camper who had used it very little and paid less than half what a new one would cost. Either way, I think it’s a good investment. Others may have solutions that work better for them and I’m interested in seeing those solutions posted as comments to this post. At this point, though, I’m pleased with this approach and recommend it to others who do longer stays in two-point hookup sites. Here’s a quick update on the macerator/blueboy approach…we’re now on the road with our 40 gallon blueboy aboard. I was pleased that I could stand it up on it’s side and have room for it in the 5th wheel bay. We’re in a CoE campground with water but no sewer hookup so we’re using the macerator/blueboy combo (and likely will be for our next few stops). It’s working exactly as I hoped. When we arrived we ran our R/O machine to make some drinking water. It creates a lot of “brine” water. We filled our kitchen tank doing that, so I dumped it using the macerator. Then, since we’ve been in this campground we’ve done three small loads of laundry (“small” is the watchword using the washer/dryer combo we have). The three loads plus bathroom sink usage filled the front grey water tank to 3/4 so I dumped again. I ended up making two trips to the nearby dump station to empty the two grey water tanks. I’m quite satisfied with this approach. 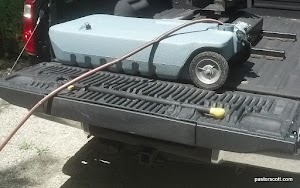 It saves dragging the blueboy through the campground and is easy enough to do. One thing I like is that when I pull the dump valve the waste water stops at the pump until I turn it on. Then, when the blueboy is full, I can just turn off the pump and the water stops. This works great for multiple trips. Let me add that I’m not planning on using this approach for black water unless it is absolutely necessary. Since the macerator does it’s thing for solids I think it would work, but the idea of holding the water hose as it pumps the “stuff” into the blueboy sounds rather yucky to me. I’ll stick with pumping shower/kitchen water. 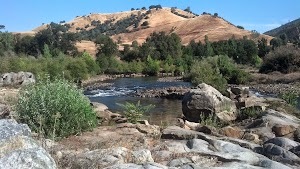 Our stay in the foothills of the Sierra Nevada was only a week and we enjoyed our campsite right on the American River so much that we didn’t do much sight seeing. 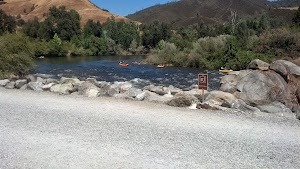 Just outside our door we could see people rafting the rapids. One day we watched paragliders soaring on the winds high above us. Less than a mile from the campground is Sutters Mill State Park where gold was discovered in 1849. There is a museum with several free films about the area, miners, early settlers and Native Americans. We walked around old Coloma, checking out the restored school, church, Chinese store and assayers office. We enjoyed a chat with the working black smith and the host at the home of the smithy. Construction is in process on a replica of the original mill. There is a memorial statue of Marshall who found the gold, started the rush, but died poor. 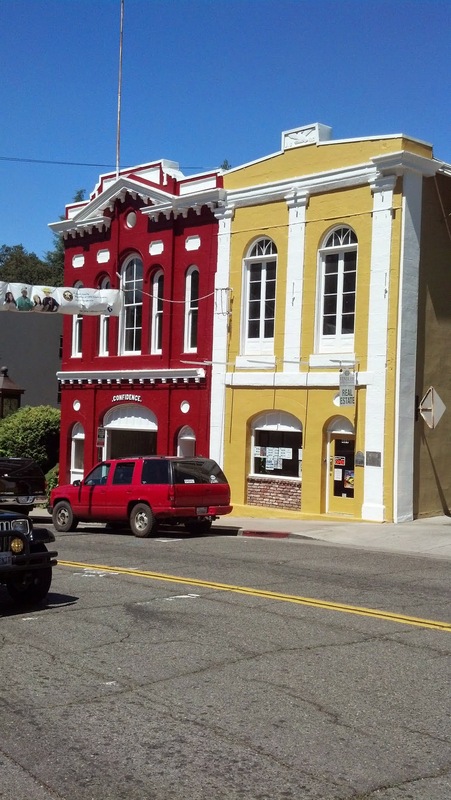 Nearby Placerville has a nice historic downtown with a variety of shops and eating places. We enjoyed going through the oldest hardware west of the Mississippi which has been open in the same location for 160 years. It has wooden floors, rolling ladders and something for everyone from appliances to plumbing supplies and paint. This street provides an idea of what early Placerville looked like. We enjoyed the area and took advantage of having a nice camp spot to relax and appreciate the natural beauty.